Hello, I have 2 plants in the same pot, as they like similar watering patterns, but I don't know what either of them are, both were 0.49p plants in some shop that i rescued, some time on and one is pretty massive and very easy to prepegate, and the other is like a grass, it seams to just multiply. I've provided a picture, if anyone can help that would be great! 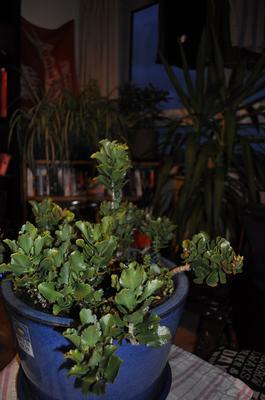 I only see one plant, which looks to me rather like a Kalanchoe. The one that this appears to be is called Flaming Katy, or Kalanchoe blossfeldiana. Once it blooms you should be able to tell, because the flowers are quite distinctive, and will be in shades of red, pink, yellow or white. You can see more about Kalanchoe species here.